Marrying early has a lot of advantages. First, it enables a couple to start bearing children early and, second, you have the strength and ability to train those children. Third, and this is very important, the couple will have children that are grown up and well settled in life while they are still young. 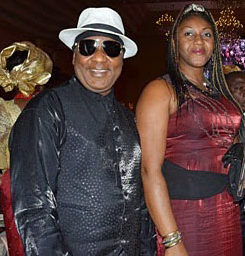 Nollywood distributor and producer, Igwe Gabosky Okoye, and his wife, Ify, is a case study. Gabosky married his wife at the age of 25 and their union is blessed with four kids, three girls and one boy. His first daughter, a medical doctor, who married, last year, just put to bed a bouncing baby boy, thus making Gabosky a grandfather while his second is currently undergoing her internship as a medical doctor in Abuja. The couple share the joy and the pain that comes with early marriage. I decided to marry early because I found myself in the entertainment industry, where we have a lot of beautiful ladies. I wasn’t looking bad. God created me as a handsome man. I said to myself I wouldn’t want to be rushed and finished by the beautiful ladies in the showbiz industry. That was why I made up my mind to marry early. Normally, men of Igbo extraction marry between the ages of 30 and 35. But in my own case, I married at the age of 25. This is because I made money very early in life. And that’s why, oftentimes, people expect to see one old man called Gabosky. I wasn’t distracted, rather I was focused. I started raising a family immediately after marriage. I am blessed with four children, one boy and three beautiful girls. And my wife and I are okay with that. When I married my wife, we were alone in the house, and when the kids arrived, it was a full house, six of us in the house. With the passage of time, they started leaving us one after the other to chase their dreams. While this was happening, I told myself if she realized that only two of us are going to be in the house again. No wonder couples decide to make more children at old age purposely to have companion. I don’t want to toe that path. But the truth is that we are alone in the house. Old people are always alone in the house. But due to early marriage which enabled us to have our kids on time, and see them through in their education, we are back to the beginning. It gives great joy that one is still young to see his children leaving the house because of marriage. If things are stabilized in this country, at this age what we should be doing is going on holiday abroad. This is because we don’t have responsibilities any more. Unfortunately, things are not moving well in the country. But to God be the glory, we are happy and in good health after finishing training our children and seeing them grow into responsible adults, and becoming responsible parents like us. One of my daughters got married last year and she recently put to bed a bouncing baby boy. That’s what I am saying. There is great advantage in good health, seeing your children grow into adults and later become responsible parents. What you owe them is quality education and proper upbringing. Couples in their old age cannot impart any value into their children. On the other hand, it’s not a good thing to be alone in the house at a very young age when your children are all grown up and have left the house for you and your wife. You need to hire hands to help you run around as well as carry out some domestic works, otherwise you must up and doing every time. But if you children are with you, you need not to run around. Because I am a business man, I am always in the office. And when she wants to travel, she makes provision for me so that I will not lack anything. We have house helps who assist me when I am in need. That’s what sustains me when she’s not around. Not at all! As educated people, we decided how many children we were going to have. It has never crossed our minds to have more children. Moreover, I have children who are beneficiaries of my scholarship programme in my home town. At my age, I feel elated being a grandmother. God has been good to me. As you rightly said, being a grand – mother at this age is not my making. It can only be the grace of God and I thank Him for bestowing that grace upon me. At times, I feel sad because my house is not as full as it used to be when everybody was around with all the noise. But overall, I still give God the glory. It is a good thing if you get married early and God blesses you with kids. You are bound to grow with your kids especially in this age of information technology where you can match them bumper to bumper so that they are not ahead of you against the backdrop of the prevailing societal ills. Yes, it’s getting back to the start. It’s a cycle just like life itself is a cycle. I just realized that you need to enjoy every stage of your marriage. I think my love for my husband is getting stronger every day. It’s like getting to where we were at the beginning. With the kids getting married and leaving, it’s like we are alone again so that we can bond a little bit more and hang out more too. They need to put God first and then learn to trust each other. Once there is trust, no matter what people may say, you will always overcome every trial that comes your way. I have always recommended that young couple should be open to each other, to be each other’s friend and learn to confide in each other. It’s very important in marriage. I have seen where things couples withheld from each other, intentionally or unintentionally, have come back to separate them. They also need to be a pillar of support to each other and praying together always as a family is very important. I miss him very well. For instance, I was away for two weeks and, when I came back, we didn’t get to spend up to one week together and he travelled. He spent more than two week there and he just returned home. I missed him a lot because any time I call him on telephone and he’s having a meeting, I wouldn’t rest until I speak to him . At least, we say good night to each other. One night I didn’t get to speak to him, I told him I was angry because I waited up till 2 am, and had to send him angry emoji . And before 5 am, he was calling to apologize to me because he slept off. You just have to keep it alive; nobody can do it for you.